UCLA publishes a number of different calendars and many leave out a critical due date for students: the tuition deadline. You have until 4:00pm to pay in-person and 5:00pm to pay online (see below). One major caveat: if the due date falls on a weekend or a holiday, it’s up to you to meet the deadline by submitting your payment by the last business day prior to the 20th. 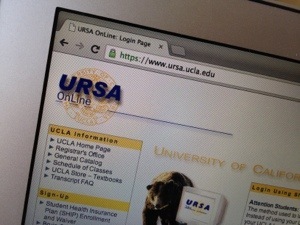 One way of paying tuition is through UCLA’s URSA system. If you need to pay in cash you can also do that at the Murphy Hall at the Payment Solutions & Compliance window Monday – Friday, 9:00am – 4:00pm. If you don’t have a lump of cash or a ton of Financial Aid, it’s going to be really hard to pay all that tuition at once. So, UCLA provides “BruinPay Plan” which allows you to make payments in installments. You’ll make one payment per month on the 20th day of each month — they’ll automatically deduct these from your bank account. It’s critical that you enroll in this program before each term — this program does no automatically renew for each term. And the deadlines are the same as the tuition payment due dates above, as long as you’re a quarter student. If you miss any of the UCLA tuition deadlines, UCLA will add late fees to your account and they’ll drop your classes. They’ll also put a hold on your student account which could impact registering for classes, financial aid and access to your transcripts. If this happens, don’t freak out. It’s usually reversible if you get in touch with the university and settle the matter. This entry was posted on Friday, June 14th, 2013 at 3:05 am	and is filed under Paying Tuition, UCLA Secrets. You can follow any responses to this entry through the RSS 2.0 feed. You can leave a response, or trackback from your own site. I want to make the tution fee payment for fall 2013 session starting in September.Is it possible to pay in advance instead of waiting for the deadline.Please advise.